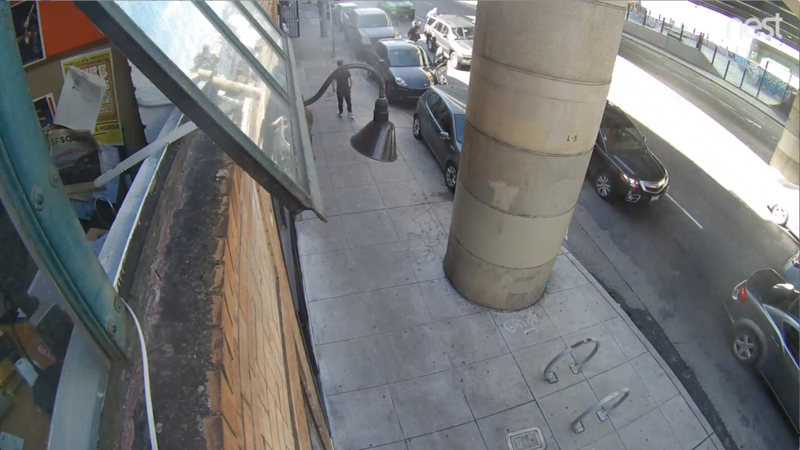 A screenshot of the security video showing Jason Perkins spraying a homeless man with what he said was mace. 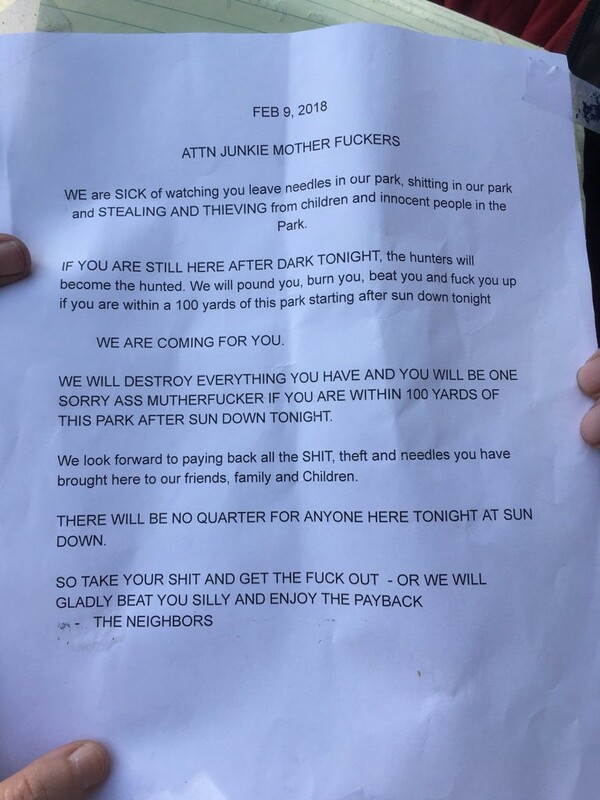 A video surfaced online yesterday showing a February altercation between a homeless man and Jason Perkins, of local venue collective Parish Entertainment Group, that some allege is evidence that Perkins was responsible for pepper-spraying a man and leaving threatening notes at a nearby homeless encampment in San Francisco. 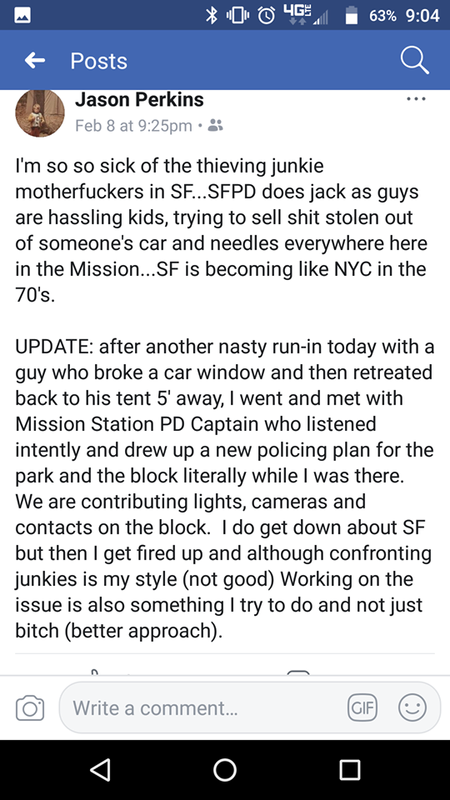 In news reports from February, the man who was pepper-sprayed said it was not the first time he and other homeless people in the area had been harassed by his attacker. Cutler said the aggressor left in a black SUV. The video shows Perkins in a black SUV. The anonymous Twitter user who shared the video described it as evidence that Perkins is responsible. Cutler said the San Francisco Police Department has been investigating the incident. SFPD did not respond to a request for comment on the status of the investigation. For years, Perkins has been a partner with the Parish Entertainment Group (PEG), which, according to its website, controls The New Parish and the Rock Steady in Oakland and Brick & Mortar Music Hall and The Crafty Fox in San Francisco. But Perkins told the Express that, for the past two years, he’s been divesting from the businesses in anticipation of moving his family overseas. Perkins’ current stake in the bars and venues under the PEG umbrella is unclear. According to filings with the Secretary of State, New Parish Entertainment changed ownership three days ago. Perkins dissolved “New Parish Entertainment Alameda, LLC” on January 23, 2017, and a new company called “The New Parish, LLC” was created on June 11, with the agent for service listed as Daniel Serot, a Walnut Creek-based attorney. Today, the New Parish tweeted and then deleted a statement: “[Perkins] no longer owns the New Parish.” Perkins said the venue is being sold, but declined to name the buyer. Shown a screenshot of the post taken in February by this writer, Perkins doubted its authenticity. A concert headlined by rapper Mistah FAB benefitting anti-homelessness organizations The Village and East Oakland Collective is scheduled for June 24 at the New Parish. D’Angelo, St. Vincent, and Big Freedia were among the performers brilliant enough to distract from Outside Lands’ gaffes and shortcomings.